Abstract: Having heard many great things about the EPoX 8KHA+ I was very excited to get my hands on one, and test it to the limits. Having heard many great things about the EPoX 8KHA+ I was very excited to get my hands on one, and test it to the limits. Now I'm not here to present a bunch of Content Creation benchmarks so mythical people can increase the speed of mythical office applications by mere numerical points. No, I'm here to review this motherboard and see what potential it has at making my system faster than anyone elses. I gues the best analogy would be setting a land speed record - how you get there is half the fun! Anyhow, since I frequent the MadOnion forums almost daily I've been reading many good things the 8KHA+ and its' high bus speeds. Perhaps I might even have found a motherboard worthy of replacing my Iwill KK266-R... and given the first few benchmarks, I think the Iwill motherboard will be out in the dumpster quite soon. After all, those KT133A chipsets can't last forever. I've seen many good motherboards, like the MSI K7T266Pro2-Ru for instance, that were good overclocking tools, but still managed to leave me craving for more raw speed. The K7T266Pro-RU had its bus speed maxed out at 164 MHz, and it was really time to see what the EPoX 8KHA+, with its' VIA KT266A chipset could deliver. As you can see, the board is quite plain, and there is little in the way of distracting frills other then onboard audio (AC'97 codec, nothing special). The 8KHA+ supports up to six PCI cards, one 4X AGP, and up to a total of 1.5GB PC2100 DDRAM in three DIMM slots. 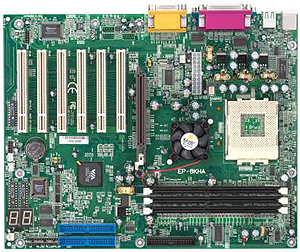 The motherboard can tackle as many as six USB ports and comes with the usual host of STR, WOR, and IrD capabilities. Of all the component positions on the Epox 8KHA+, I'm least happy with where the ATX power connector is placed - even though I know it is for the boards' own good. Draping power wires over the processor intake fan has never been a good thing, so I'd suggest tying the main power cable to the case and running it around, rather than diagonally over the processor. Nothing is ever going to be exactly the way you want it to be, but it is important to work with what you have and make the best of it. In any case, I suppose the knowledge that the particular placement provides steadier power to the MOSFETS is satisfying. Speaking of MOSFETS, EPoX have positioned half of them on the underside of the motherboard. This is a very sensible idea, and one that really hasn't been picked up on too many motherboards I'm aware of (if any).